There are some possibilities of how to improve performance of BW’s infocubes. One of them is to flag particular dimension Line Item Dimension. This can be done for dimension where there is exactly only one characteristics assigned into it. This is so called degenerated dimension. Doing this no dimension table is created. So SID table of that characteristic is acting as dimension table. Then there is fast access to the data as no real dimension table is present. 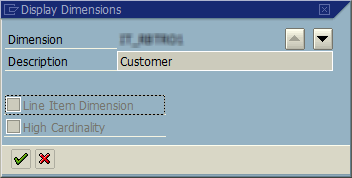 As the model is simplified loading into that dimension is faster as no IDs for dimension table are generated. There might an issue arise when you do some changes. The changes can be related to adding or deleting the IOs from such an Line Item Dimension. It is clear that no other IO can be added to such a dimension. However let imagine that I want to deactivate that flag and add other IO. For some reason this may not be possible. Or I want to get rid of whole dimension but system tells me that I have to remove IO first and it is again not possible. In such a cases I removal of the flag can be done won database level. The flag as itself is stored in following table. The table is called RSDDIME (used in DB view RSDDIMEV) and field is called LINITFL -> Line Item Dimension. By removing the flag = X particular dimension can be deleted form the cube. Disclaimer: Notice the blog post discusses activities done in debugger while changing the values of table fields. Such activities are usually not supposed to be executed. Bear in the mind that you may cause serious harm into your system. If you decide to proceed with it do it only after real understanding of all consequences and only on development and/or test system. Great detailed information. Keep up the good work! Great detailed information. Thanks and keep up the good work! Heartbleed – bug in OpenSSL, is SAP affected?